Adobo Nights! The first of its kind. Who doesn't love Adobo? Oh yes I definitely had it at Opus...and it was a blast. If you might be wondering what kind of Adobo had I had this time, it was incomparable. Incomparable in the sense that it is internationally acclaimed for bagging awards in advertising. Known to many of our country's movers and shakers. Quintessential in the industry of communication both in the digital and media platforms. It's not pork nor chicken, it's a magazine. 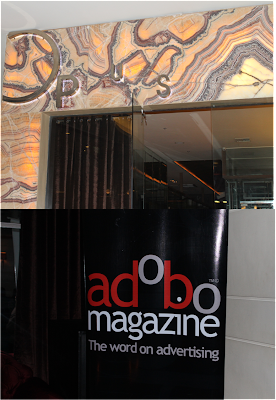 adobo magazine is a premier publication for advertising and marketing being the Philippine Advertising and Brand Communication magazine. It covers news on advertising campaigns, current trends in the industry, popular people and their contributions and a lot more. The people behind it ended the month of January with a night of getting to know people, networking, enjoying colleagues and just have a night out with good drinks. It hopes to have a series of nights such this to gain more interest in other companies and of course, have fun while everyone's at it. The event started up at 930 with an open bar till 11 pm. The place was jam-packed and everyone seemed to know each other. It was indeed a different take of adobo for me. Thanks to Ms. Apple Esplana-Manansala who invited me to the event and introduced me to this kind of magazine which to be honest, I never knew we have this till that night at the Opus, Resorts World Manila. To know more about adobo magazine, check out their website HERE.